In a very good well matched fight Sullivan Barrera and Joe Smith Jr opened the HBO telecast in a WBC International light heavyweight title bout. Sullivan Barrera defeated Joe Smith Jr by UD Scores: 96/93 97/92 97/92. Joe Smith Jr pressed the action in round one which allowed Sullivan Barrera to score early. However Smith landed a hook to the forehead that dropped Barrera. He recovered and the round ended. The fight continued into round two with the same type of action. Smith focuses on body and trying to land that big power punch. 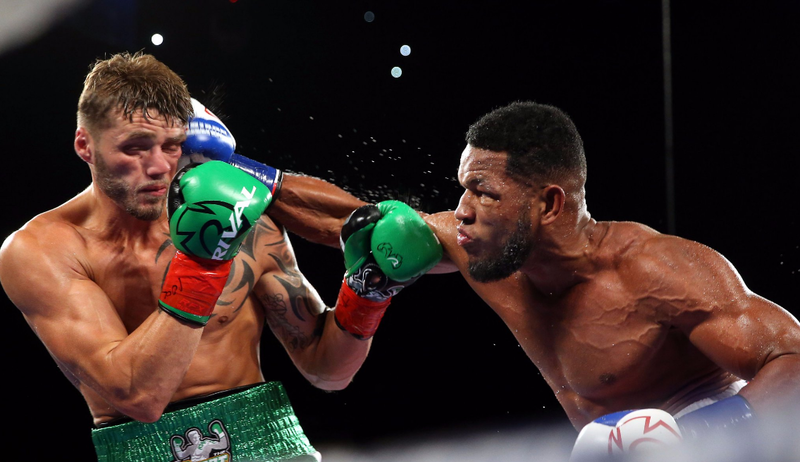 Sullivan Barrera started round three forcing heated exchanges. Heading into the four it looked as if Smith was not hurt or dropped as he pressed the action and landing well. Then late into the round Barrera hurt Smith with an uppercut. As Barrera was landing more punches and slowly tipping the fight in his favor. Confidence continued to build as Barrera was landing more and controlling the pace of the fight. Smith looked as he started to punch in defence. Then Smith landed a big shot that stunned Barrera but he quickly recovered. Barrera's counter punching and stiff jab started to punish Smith in the second half of the fight. Smith's corner going into the 8th round was asking if he was ok and stating that he was blowing the fight. Clearing seeing that Smith was in trouble and possibly stopping the fight. They know Smith will fight hurt and they wanted to make sure he was ok. Round eight we saw much of the same with Barrera landing at this time 100 more punches than Smith. The round ended with a lot of unanswered punches from Smith. His corner continued to express concern stating that they made need to stop the fight. Smith with a skill deficit in the late round showed a lot of heart hanging in and trying with all he has going for the big KO punch. Barrera also going for the big KO punch in the last round. Unsuccessful the fight ended and went to the cards. Kovalev is looking for an opponent as he is coming off lost to Ward. This may be a good fight for Barrera.